There are currently 0 users and 390 guests online. Mega Mountain 2100 is a "climbing platformer metroidvania" without an ability to jump that's an unofficial sequel to the Glorious Trainwrecks classic Mega Mountain. 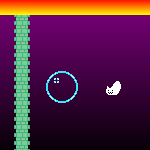 It's heavily inspired by indie classics like Cave Story, Undertale and Mega Mountain. The game isn't finished yet. The game *.exe and the itch.io page are placeholders and everything can change at any time. - not too much, it's a demo. (C) 2017 Adrian Makes Games. Original Mega Mountain by sylvie. Made with love.